Manners don’t come naturally to everyone! But did you know that elephants are known for their impeccable etiquette? It’s true! This hilarious guide to good manners offers many fun teaching moments for kids and their parents-it covers all the basics for the preschool set, from saying please and thank you to sharing and being kind to others. Filled with bright, adorable illustrations in Hello!Lucky’s inimitable style, young children will love learning about manners with this delightful, sturdy board book. Eunice and Sabrina Moyle, the team behind Hello!Lucky and the creators of Super Pooper and Whizz Kid: Potty Power!, have created another glorious board book, this time about manners. Kindness Rules offers a fun and clever way to teach little ones the basics of etiquette and politeness. From saying please and thank you, to listening when someone else is speaking, learning to apologise, how to share, greet new people and ‘use your words’ when upset, this book has it all. 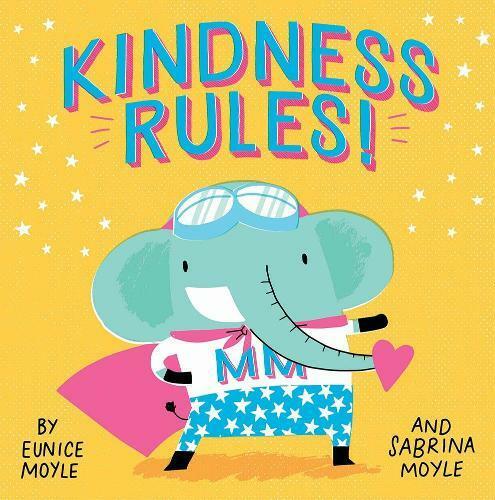 Featuring a cute elephant with star-covered ‘positive pants’, a pink ‘cape of kindness’ and ‘respect-acles’, the brightly coloured and witty illustrations beautifully complement the text and show the elephant’s amusing transformation into a superhero: ‘Magic Manners’. Kindness Rules is a great addition to the Hello!Lucky range. It’s perfect for ages 1+, and any adult who wants to brush up on their own manners!